Beat the heat, enjoy the view, avoid the traffic, and save your self some time and leave the flying to us. 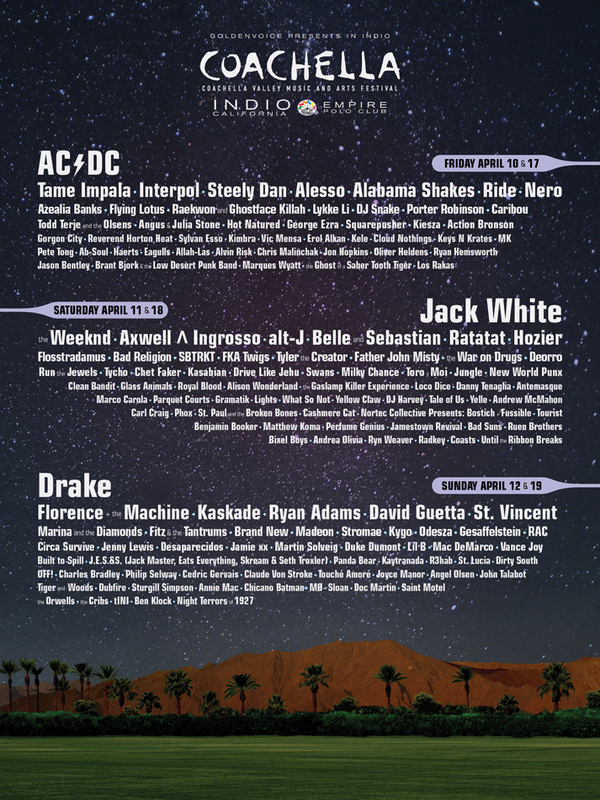 The Coachella Music Festival is located 144 miles from LAX and takes over 2 1/2 hours by car. Our Helicopter Charters fly you directly to the Bermuda Dunes Airport which is just 7 miles from the Music Festival, in less than 90 minutes. This year depending on the demand we will be offering several options on getting to the music festival. A one way drop off charter, a one way pickup charter, and a round trip chart each day with standby so you can leave when you want. We will also be offering airtaxi service from the Palm Springs International Airport to the Bermuda Dunes Airport, throughout the day during the music festival. Departing from the Hawthorne Airport, this helicopter charter takes you directly to the Bermuda Dunes Airport in Indio which is 7 miles from the Coachella Music Festival. We will standby at the Bermuda Dunes Airport each day ready to wisk you back to Los Angeles each day when you are ready to leave. Package Details. Price includes up to 4 people in the Bell Jet Ranger. The 90 minute flight Departs from Hawthorne Airport arriving at the Bermuda Dunes Airport. We will standby throughout the day until you are ready for your flight back to Los Angeles add $150 per hour. Requires a minimum of 5 days advanced notice to schedule and book the tour. Last departure times from Bermuda Dunes airport is sunset, night take-off and arrivals are not permitted, a $500 dollar charge will be added for overnight stay. Weight limit per seat is 350lbs, with a total passenger weight including pilot of approximately 1000lbs. Cancellations require a minimum of 48 hours notice. A cancellation fee equal to 50% of the above cost will be charged on cancellations if the flight is canceled less than 48 hours in advance. Same day cancellation will be charged full rate. Departing from the Hawthorne Airport, this helicopter charter takes you directly to the Bermuda Dunes Airport in Indio which is 7 miles from the Coachella Music Festival. You will be dropped off at the airport and we will depart back to Los Angeles. Package Details. Price includes up to 4 people in the Bell Jet Ranger. The 90 minute flight Departs from Hawthorne Airport arriving at the Bermuda Dunes Airport, where you will be dropped off. Requires a minimum of 5 days advanced notice to schedule and book the tour. Last arrival and departure times from Bermuda Dunes airport is sunset, night take-off and arrivals are not permitted. Weight limit per seat is 350lbs, with a total passenger weight including pilot of approximately 1000lbs. Cancellations require a minimum of 48 hours notice. A cancellation fee equal to 50% of the above cost will be charged on cancellations if the flight is canceled less than 48 hours in advance. Same day cancellation will be charged full rate. Departing from the Hawthorne Airport, this helicopter charter will pick you up at the Bermuda Dunes Airport in Indio which is 7 miles from the Coachella Music Festival, and we will depart back to Los Angeles. Package Details. Price includes up to 4 people in the Bell Jet Ranger. The 90 minute flight Departs from Hawthorne Airport arriving at the Bermuda Dunes Airport, where you will be picked up and returned to Hawthorne Airport. Requires a minimum of 5 days advanced notice to schedule and book the tour. Last arrival and departure times from Bermuda Dunes airport is sunset, night take-off and arrivals are not permitted. Weight limit per seat is 350lbs, with a total passenger weight including pilot of approximately 1000lbs. Cancellations require a minimum of 48 hours notice. A cancellation fee equal to 50% of the above cost will be charged on cancellations if the flight is canceled less than 48 hours in advance. Same day cancellation will be charged full rate. A quick 8 minute flight between Palm Springs International Airport and Bermuda Dunes Airport is available throughout the day during the Music Festival. Package Details. Price includes up to 4 people in the Bell Jet Ranger. The 8 minute flight Departs between the Palm Springs International Airport (Signature FBO) and the Bermuda Dunes Airport daily between 10:30am and 7:00pm. Requires a minimum of 5 days advanced notice to schedule and book the tour. Last arrival and departure times from Bermuda Dunes airport is sunset, night take-off and arrivals are not permitted. Weight limit per seat is 350lbs, with a total passenger weight including pilot of approximately 1000lbs. Cancellations require a minimum of 48 hours notice. A cancellation fee equal to 50% of the above cost will be charged on cancellations if the flight is canceled less than 48 hours in advance. Same day cancellation will be charged full rate. The festival showcases popular and established musical artists, as well as emerging artists and reunited groups. Notable appearances include: Amy Winehouse, Dr. Dre and Snoop Dogg, Prince, Paul McCartney, Arcade Fire, Wu-Tang Clan, The Killers, Duran Duran, Radiohead, Oasis, Daft Punk, Roger Waters, Madonna, The Cure, Florence and the Machine, Kanye West, The Black Keys, Rage Against the Machine, Beck, Gorillaz, Björk, Nine Inch Nails, The Strokes, The Chemical Brothers, Pavement, Blur, The Stone Roses, The White Stripes, Jay-Z, Tool, Beastie Boys, Muse, Red Hot Chili Peppers, Justice, Lucent Dossier Experience, and Foo Fighters. Coachella is one of the most famous, largest, and the most profitable music festival in the United States. In 2003 Coachella started allowing tent camping as an option for festival lodging. The campground site is on a polo field adjacent to the venue grounds and has its own entrance on the south side of the venue. 2010 introduced many new features, such as re-entry from the campsite to the festival grounds, parking next to your tent, and recreational vehicle camping spots. For that festival, there were more than 17,000 campers. At the 2012 event, on-site facilities included recycling, a general store, showers, mobile phone charging stations and an internet cafe with free WiFi. The festival takes place in a desert setting as the city of Indio is a part of the California Desert. Temperatures during the festival’s history have ranged from 107 °F (42 °C) through 41 °F (5 °C). Organizers of the Coachella festival manage its carbon footprint by involving employees and attendees. The festival organizers promote carpooling and reward people who participate: cars with four or more people that display the word “carpoolchella” somewhere on their car may be selected by a secret spotter to win VIP tickets/pass for life for everyone in the car. In 2007, Coachella teamed up with Global Inheritance to start a 10 for 1 recycling program, in which anyone who collects ten empty water bottles receives a free one. In 2009, the festival introduced ten dollar refillable water bottles, which purchasers could refill at water stations inside the festival and within the campgrounds. The success of Coachella in its early years proved music festivals could work and succeed in a destination form, as opposed to a traveling festival. The year of Coachella’s debut was also the year of Woodstock ’99, which was marred by riots, fires, and rapes, turning many people off of music festivals. In the years following Coachella’s success, many other festivals have followed in its footsteps, copying its format as a destination festival with multiple stages, attractions, art, and camping. Some of these new festivals have grown to achieve the same success as Coachella, such as Lollapalooza in Chicago and Bonnaroo in Tennessee.